Kay, who drove an ambulance during the war and lived life at full throttle, now dresses in mannish clothes and wanders the streets with a restless hunger, searching; Helen, clever, sweet, much-loved, harbours a painful secret; Viv, glamour girl, is stubbornly, even foolishly loyal, to her soldier lover; Duncan, an apparent innocent, has had his own demons to fight during the war. Their lives, and their secrets connect in sometimes startling ways. War leads to strange alliances. Tender, tragic, and beautifully poignant, set against the backdrop of feats of heroism both epic and ordinary, here is a novel of relationships that offers up subtle surprises and twists. The Night Watch is thrilling. A towering achievement. This wonderful novel explores the lives and relationships of a handful of women and men in post-war London. The writer has created very realistic, believable characters; as a reader I felt I really got to know them and cared about them. The structure of the book is very effective, as it moves backwards in time to reveal how the characters met and what has brought them to this point in the story. This adds a nice touch of suspense. Sarah Waters brilliantly recreates the atmosphere of London during the blitz and in the years immediately following the war. I didn’t want the book to end, which for me is always a good measure of a novel. An interesting book, which I failed to finish. I bought this book because I had been looking for a fictional novel focussing on Londoners during WWII. In this, I suppose I was always going to be disappointed. This is the story of four people living through the war, but I suppose I'd been expecting more detail of life in London - especially given that the summary mentioned Kay driving ambulances. However the book focuses very strongly on the personal lives and problems of the character, as opposed to the overarching theme of war. The queer themes were completely unexpected, but not unwelcome, I'm always on the hunt for some good queer lit. and was pleased to find some set in an era long past. The problem, I feel, was twofold - one, the characters were, for the most part, difficult to relate to and their inner monologues often lead me to dislike them, and two, the story seemed to drag to the point where very interesting moments became dull and unending. The narrator did a superb job. I was a little unsure of her performance when I began the audiobook, but as the story progressed I began to feel that her reading suited the book very well. I did my best to complete this novel because I did enjoy the plot, but in the end I simply couldn't make myself continue listening. Perhaps I'll pick it up again one day, I rather hope I do for the sake of completion, but if I do I don't doubt that I will find it just as difficult to complete as I have this time. One of the best narrators I've heard! What an incredible narration feat from Juanita McMahon! I don't know how many characters there are in this book, but the voices, men and women, young and old, of all classes are rendered superbly. Moreover, the dialogues are spot on! I hear the BBC is working on a TV version... Hope it's half as good as this audiobook is! I thought this was excellent. 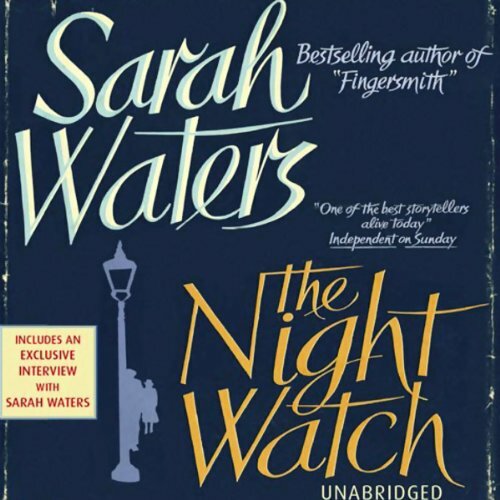 I like Sarah Waters' books and I've read all of them, and I only wish that there were more available as audiobooks; I find that listening to a book that is well read gives new understanding to a work. Juanita McMahon is a very good reader. I have sometimes had the impression when listening to an audiobook that the narrator really doesn't understand or appreciate what he or she is reading, but that is certainly not the case here. One of the really good ones. I bought this Title because it was classified as historical. The story of four girls and a boy's survival of the second world war, I thought this is a topic that's not explored much and was interested. There was No mention in the summary of lesbian relationships, the main topic of this book! So with out being discrimanating I would like to mention that not all people like reading about this kind of relationships, so if this is your interest you in for a ball! 8 sur 20 personne(s) ont trouvé cet avis utile. When I started listening to part 1, I had difficulties becoming familiar with the different protagonists, as the story begins from the end and then works its way to the beginning. Anyway, I kept listening, and I really enjoyed learning more about the living conditions during and after WW2. The descriptions were well done, and captured the atmosphere very well. I found the stories about Kay, driving her ambulance, especially interesting. The reader, Juanita McMahon, did a good job, and I felt that she interpreted the story and the characters well. For me, the end of this audio book came quite abruptly, especially as I could see that another 15 minutes were left. The surprise was an interview with the author, which was enlightening. It also provided background information about her own sexual orientation, which is reflected in the lesbian relationships that are part of this book.